The intent for today was to find crappie on a pond that hasn’t been checked by up with year. The body of water is large and composed mainly of a large basin. We figured that is where we would find many of the fish holding up. The day was warm in the mid 20’s with light and variable wind with a chance of precipitation later in the day. The morning bite was not on. We marked plenty of fish on our flashers but none were too aggressive. Throughout the entire morning, we punched a ton of holes but only caught 2 crappie and maybe two dozen dink perch. Close to 10 am we decided that we would be better off heading out to another pond that was similarly structured with a deep water crappie bite. Pulling into the second lake the snow flakes started to fly. We fished for quite a while before catching anything the fish we were after. 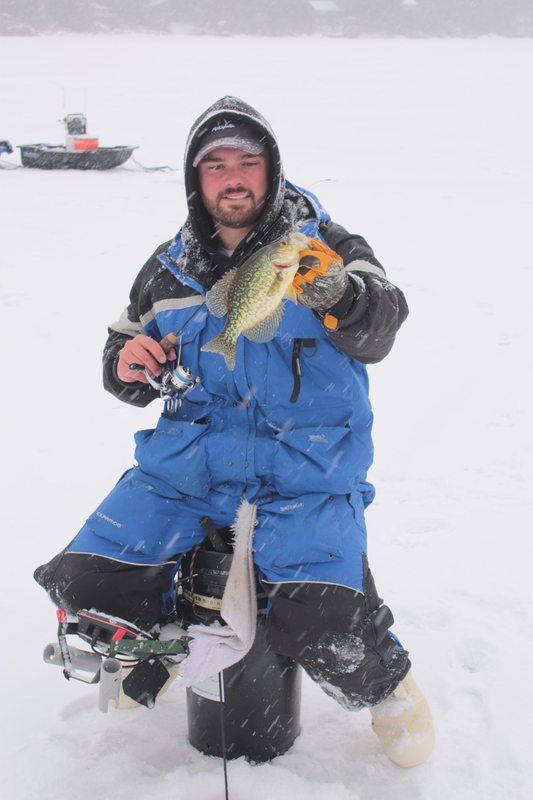 In about 2 hours we caught 3 crappie, a few white perch, and way too many 4″ yellow perch. Not knowing what to do we worked every way that we figured a moving pod of crappie could do. In the end we worked into slightly shallower water that has held fish in the past. Working from 30′ to about 20′ was a nice change as our baits make it to the bottom in quite a bit less time! The first few holes were dry but about four holes in, I brought up the first decent crappie. Following that, nothing happened. we worked through a bunch more holes with nothing going on. Taking a minute, we talked about how the white out conditions were not that enjoyable and heading home was probably the best option. As a last ditch effort, I ran back through our most recent set of holes looking for another quality fish for pictures. The snow was starting to let up and I only wanted one! The very last hole in the set was the best sight all day. Putting my Vexilar down I saw four fish on the screen. As I worked my bait down, a fish charged up almost 10 feet to meet it’s free ride to my hand. Hollering to my buddy and waiting for him to show up, I caught six more crappie. As he walked up, I told him to drop. We went fish for fish until the hole went dry. 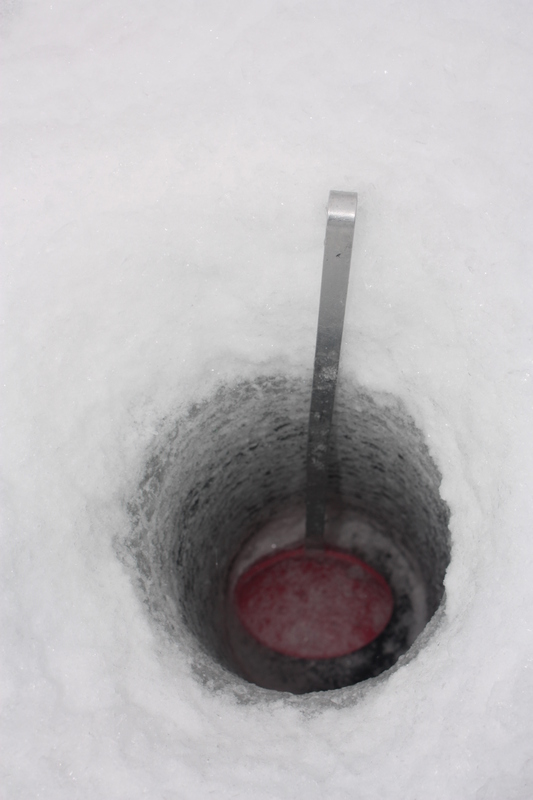 When the fish were gone I punched more holes in the direction we thought they went. The plan was a success. We followed them through 3 of the 5 holes I punched catching a good deal of fish. As the fish disappeared again we did the same thing. For four sets total, spanning about 100 yards, we followed the fish taking turns catching them. 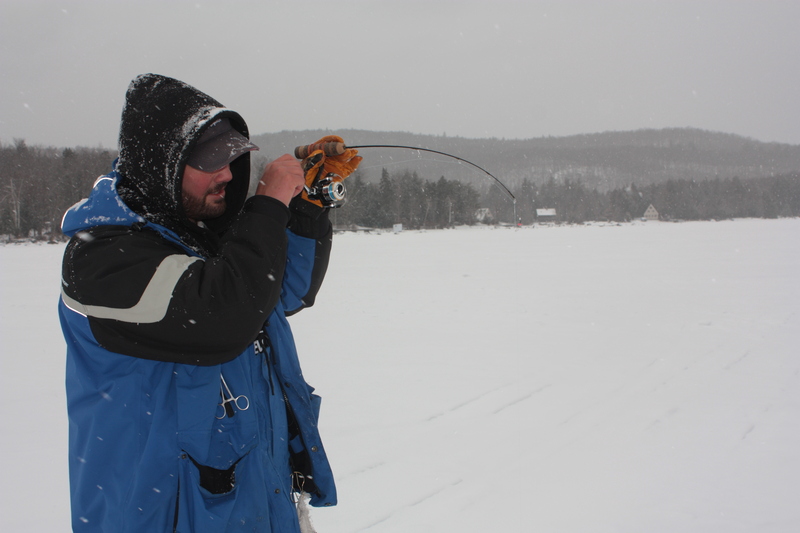 Once the fish got away from us, we decided to pack it up before the roads got any worse. We learned a lot today about following the fish on this new lake and a good route that they take from a 20′ flat into their 30′ bowl. Staying mobile was the key to our limited success today and we might have had some help from the weather. The best success we had today started just as the snow let up and lasted for about 40 minutes until the snow started coming down hard again. Some of the best ice I’ve seen this year. Up to 16″ in some spots!